Tomorrow, the family & I will be spending the day at the Graphica in Education conference. it’s a one-day event held at the Fordham University Graduate School of Education — Lowenstein Center (Lincoln Center Campus) on the exploding issue of comics in the classroom. Unlike back in my day, when the only comics in school were hidden behind my notebook during Spanish class (or when I drew my own during lunch hour), there are now official, sanctified comics-in-education programs springing up throughout the country, in schools, libraries, and higher education venues. The all-day conference boasts speakers like Jessica Abel and Comic Book Project founder Michael Bitz, keynote addresses by James Bucky Carter, Ph.D. and Jon Scieszka, and panels like "Making the Case for Comics in the Classroom," "Construction of the Graphic Novel & How It Fosters an Understanding of Self," "Using Graphic Novels to Improve Reading Skills and Teach Visual Literacy," and "Adult Comics Books: What They Get Out of Reading." Since we’ll be there with Phoebe, I probably won’t get a chance to attend any of the panels, but Sari, with her background in education and comics, is very interested in a number of them. I’ll probably hang with Phoebe in the table/booths area for much of the time. The conference is a convergence of sort for my various professional selves, as it is co-sponsored by, among others MoCCA, Random House/Pantheon, and Teachers & Writers. T&W will be hawking copies of their special "Comics in the Classroom" issue (with my cover art and Sari’s piece on integrating comics into textbooks) as well as Dave Morice’s Poetry Comics book. 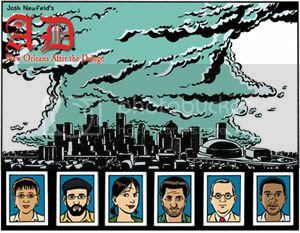 The Pantheon folks will be pimping Persepolis and … A.D.! I hear word that they’ll have flyers, sell sheets, and, best of all, a readable dummy of the whole book, based on my latest manuscript, complete with the jacket design (which I just finished two days ago). I cannot wait to see it. Admission to the conference is rather steep, at $140 for general admission, $85 for librarians & Fordham faculty, and $30 for students (free for Fordham students). But if you’re a MoCCA member, it’s only $25 at the door (use the code MOC1). Saturday, January 31, 2009, 9 a.m. – 5 p.m. I have one important question, though: is "graphica" the new "graphic novel"? Done! On Thursday I uploaded A.D. to the Random House/Pantheon FTP. Finally, after two solid years on the project, I completed the book. This last deadline was by far the toughest, requiring me to basically work nonstop from Thanksgiving ’til Thursday, and even demanding an all-nighter right up to the very end. (I was up continuously from 8:30 AM Wednesday ’til about 11:30 Thursday. Then I took a two-hour nap and fine-tuned things until about 10:30 that night. Ugh.) I’ve had my head buried deep into the book for the last 45 straight days, and am just now starting to blink my eyes and look around again. Thank you, Sari, for picking up all my parenting slack! And thank you, Rachel and Ben (my assistants), for all your hard work down the stretch run. Last of all, thank you, Charlie Orr, for coming in with a week to go and putting together an awesome publication design. The Pantheon version of A.D. will be greatly expanded from the online version, with lots of new material covering the Convention Center and the characters’ lives since the hurricane. In total, there are 65 new pieces of art out of a total of 290. The reason I call them "pieces of art" instead of "pages" was because of the format I drew A.D. for the web, where each "page" of the web version became in essence half a page of the book version. Forget it, it’s too complicated. The simplest thing is to say that the book will have nearly 25% more original art — as well as major revisions, text changes, and re-colorizations of the previous work. The whole thing is gonna weigh in at just about 200 pages. Much more to come on that front. 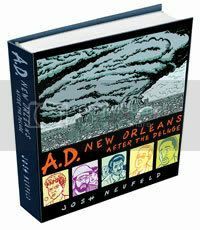 Pantheon Graphic Novels will be publishing the print version of A.D.: New Orleans After the Deluge! 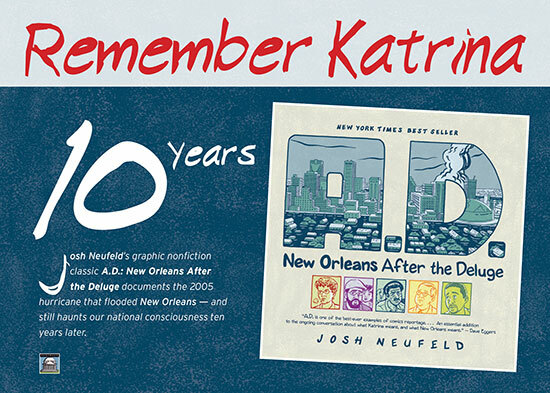 The hardcover is scheduled to come out in August of 2009, shortly before the fourth anniversary of Hurricane Katrina, and will be printed in a four-color process, enabling me to retain the color tinting style I’ve been using so far. Pantheon will follow the hardcover with a trade paperback. I envision the book to be in the 200-page range, and it will include new material that won’t be in the web version of A.D. (A.D. is currently winding down on the web: I plan on releasing three more chapters before it wraps up online.) We’re also hoping to donate part of the proceeds from the book to grassroots relief organizations in New Orleans. I’m still sort of in shock about the news, as I couldn’t have dreamed of a better publisher for this project. I’m thrilled that the stories of Denise, Hamid, Leo & Michelle, The Doctor, and Kevin will be exposed to a larger audience; and I’m overwhelmed about being published by the same folks who publish Speigelman, Clowes, Ware, Satrapi, Katchor, Burns, and Simmonds.